What is plank grilling? 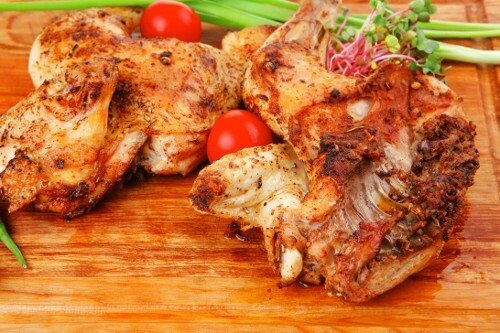 Plank grilling is becoming extremely popular with everyone who loves to grill and wants to experiment with new flavors. Plank grilling is simply using a wooden plank when you are cooking your favorite foods on the grill. Fish is a favorite choice for people who choose to cook on a plank. Planks are offered from different kinds of wood and each wood adds a unique flavor to the foods you are grilling. Cedar is the most popular type of wood because of its distinctive flavor, but oak and cherry are popular, too. Before trying plank grilling, the wooden planks have to be soaked in water for several hours, if not overnight. The water-soaked wood will allow the foods to cook and not burn the wood. Why Is Plank Grilling So Popular? One reason plank grilling is becoming so popular with those who like to create new recipes is that flavored liquids, such as juice or wine, can be added to the water the planks are soaked in to change the flavor as your food cooks. Because the different types of wood add different flavors and the number of liquids that you can add is unlimited, you will always be able to create new and delicious foods, even if you use the same type of meat each time. Herbs are also a favorite way to change the flavor of your meal easily. Garlic and dill are popular, but you can use any herb that you love. Citrus fruits, such as lemon, lime and orange, are often sliced up and cooked alongside the fish to add more flavor. The meals you will be able to whip up will be limited only by your imagination in what type of herbs and other flavors you add to your meat. Plank grilling also allows you to create an entire meal at one time. Slice vegetables and cook them on the plank beside your main dish. The flavor of the wood of the plank will add a new twist to your vegetables. Clean up is a breeze when everything is grilled on the same plank. It is even possible to create a dessert using your grill and wood planks. Many people like to cut apples into eight pieces and add a little cinnamon before placing on their cedar planks. They can be served warm with caramel sauce. The internet is full of possible desserts you can easily create with plank grilling. Another simple recipe is to cut fruit up and place on the plank. Drip molasses or honey over the cut side and grill until the fruit is soft. Plank grilling is easy and fun for everyone to try. A big part of the fun is experimenting with different foods and flavorings to see what will become your family’s new favorite grilled supper.